Excellent for apple pies and to eat fresh. 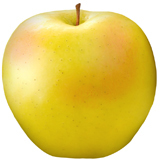 Ginger Gold is a yellow apple variety which entered commerce in the 1980s, though the original seedling dates from the late 1960s. Developed by: Ginger Harvey, Virginia. This sweet-spicy apple has a succulent texture and rich taste. A cross between the Golden Delicious and Albermarle Pippin, this early-season variety is best served fresh.The primary use is for eating out of hand, though it can be used for most other purposes. The flesh, of a cream color, resists browning more than most varieties. The flavor is mild but with a tart finish. Skin feel: Smooth, Shiny, Glossy, Porcelain-like. Russet details: Dots, Patches, Spots, Netting.